This week's One Layer Wednesday is being hosted by Karen. The challenge is to make a card that makes you smile. Well, I have to tell you, I was not smiling on Wednesday when it was time to make this card. I had left it quite late in the day (having spent my time preparing a new recipe for dinner and then talking to my sister - two things that really do make me smile), and NOTHING was coming to me. It was just about time to go get Kate from school and then take her to figure out her Hallowe'en costume (also leaving that a bit late - the stores are a zoo right now! ), Hallowe'en candy and then to her swimming lesson. No time left - especially because if I don't get the photo taken before about 4:00, the light is going and forget it! I desperately started playing around with yesterday's circle layout, thinking perfect stamping would make me smile. Three imperfect attempts later, I was out of time and practically in tears. (Isn't it silly, the pressure we put on ourselves?!) Then this idea came to me. Much less stamping involved! And I have to say, I'm SO happy with this! These icons represent things that make me smile (music, flowers, love, home, snowflakes (not snow) and butterflies). Of course other things make me smile, but I don't have little icon stamps that would fit in those circles for everything that I like! lol! And think of the possibilities of this simple layout - this can be easily changed up for any occasion just by changing the colours and the icons! I definitely see a few variations of this in the future, and that makes me smile! So happy that you were able to work through the pressure of feeling you had to create and simply enjoyed the process of creating! Beautiful results with flawless execution! Absolutely love your brilliant card. great card Ardyth...thanks for playing along with the OLW this week. I know how you're feeling about this challenge. I have a tough time trying to decide what to do...but you're so clever...what a great idea! Wish I'd thought of that...but then I probably wouldn't have had the proper stamps! I had to go with digi this week...not my favorite thing to do as I feel a bit like I'm "cheating"! LOL! Excellent card! This made me smile!! I do like the icons and the simple sentiment - just perfect! Love your idea about keeping this versatile ... how fun is that?! Also love how your card is more than just a pretty face, there's a lot of meaning behind it. Beauty and Brains! Get it together, girl! I'm just kidding~it sounds like you have a bunch of balls you're juggling at once at any given time, so I'm impressed at how many fun and clever cards and posts you create! This card is no exception!! 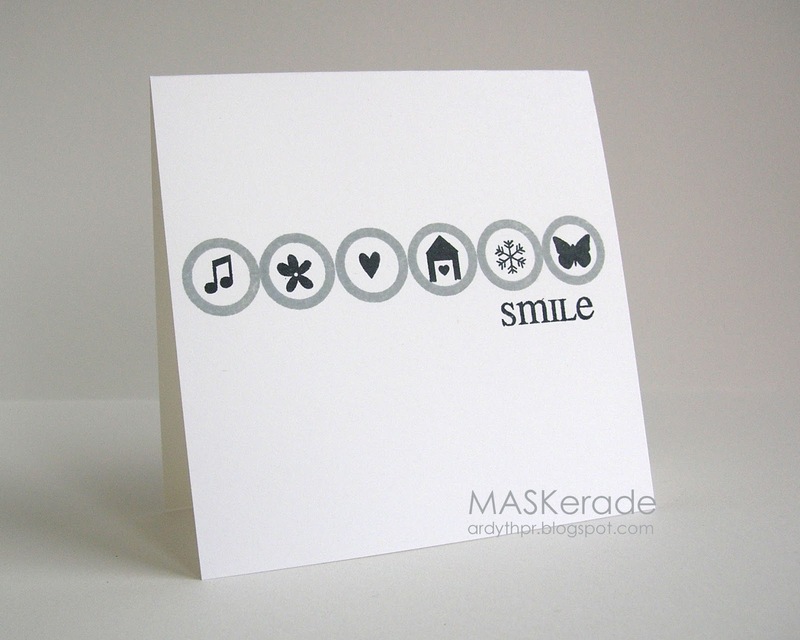 How super that you had these sweet little icons to represent some of your smiley faves! This card made me smile, because it's so you!